This week's tutorial over on Splitcoast is another sweet gift bag - this one is perfect for a book or set of cards, and it's adorable with double sided paper! Here's a closer look at that tag, which I made from one of the strips I trimmed from my paper sheet - I thought this stamp image matched the paper theme perfectly... this is one of my designs from Impression Obsession - it's called Lily of the Valley. The sentiment is from one of my sentiment builder sets called Blessing Brush Words. So sweet. I really like the tag you added. Makes it look like a real bag. very cute bag! 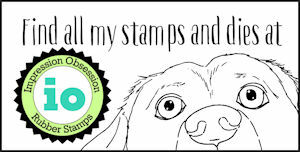 however my question is how do I find the tutorial you did on using wood block stamps with the misti?